Remove From Other Playlists will remove the selected tracks in the selected playlist from every other user-created playlist, such that the selected playlist is the only user-created playlist that contains them. The track entries in the Media Library playlists (Music, TV Shows, Audiobooks, etc) will not be affected. And, perhaps obviously, the script cannot remove tracks from Smart playlists since they are created dynamically; it’s likely any track you remove would just be sucked back in. More information and download for Remove From Other Playlists is on this page. I don’t burn CDs much anymore these days. Sad! So when a Correspondent inquired if a script could be written to split up a very long playlist into CD-sized “sub-playlists”, I fuzzily recalled (and Kirk confirmed) that iTunes will ask for additional blank CDs if a single CD is insufficient; such a script would be unnecessary. But then I thought that there might be other reasons to split up a large playlist into smaller playlists. Say, for example, one wanted to limit the CD contents to only 60 minutes. Or, forget about burning CDs (which, I guess, I have), maybe smaller playlists would be convenient for one’s listening regimen. So I wrote the script anyway. It was a fun Sunday morning project yesterday. These particular playlists contain local file tracks as well as remote iCloud Music Library tracks, so I couldn’t really burn CDs from them. 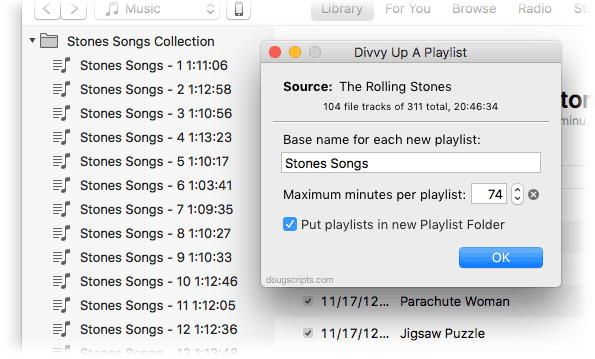 But whenever I want to listen to my Rolling Stones collection in 74 minute chunks I’m all set (the script can create “sub-playlists” limited in size from 30 to 120 minutes; 74 minutes is the size of a typical CD). Divvy Up A Playlist is for macOS 10.10 and later and free to use with a donation nag. More information and download is on this page. 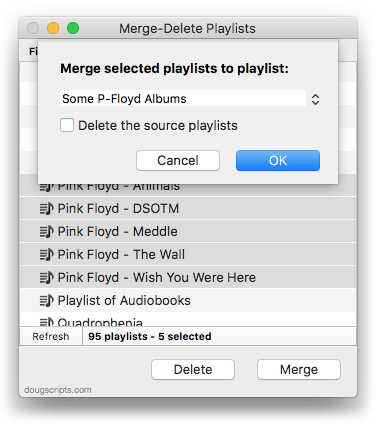 Merge-Delete Playlists will allow you to merge the track contents of two or more playlists to a new or existing playlist or delete any number of playlists at once, including Smart, Genius, and Playlist Folder playlists. The merge feature will prevent the same tracks that may appear in different source playlists from being duplicated and has an option to delete original playlists. The delete feature only deletes playlists; tracks, of course, remain in the library. This latest version brings back Apple Music playlists detection; the last version removed this ability because I hadn’t worked out all the details on how to handle them properly. They will appear with their names italicized at the top of the list in the window. It also fixes a bug that prevented selecting empty Playlist Folders. Merge-Delete Playlists is free to use full-featured for ten days, thereafter requiring a registration code which can be purchased in-app for $1.99. It can be downloaded from this page. Kirk and I go deep on playlists in iTunes in this week’s episode of The Next Track podcast. Real deep. This episode is sponsored by Audio Hijack from Rogue Amoeba. If you can hear it on your Mac, you can record it with Audio Hijack. Download a free trial of Audio Hijack and be sure to check out a special offer for The Next Track listeners in this week’s episode. You can listen to the episode at The Next Track website here or subscribe here in iTunes to make sure you get all future episodes. 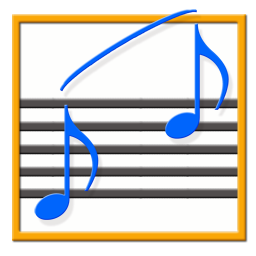 I have just updated Delete Empty Playlists to v3.0. The previous version would simply delete any empty playlists it found. But I frequently found that I wanted to keep a few, especially if they were Smart playlists with criteria that would just be a pain to re-create. 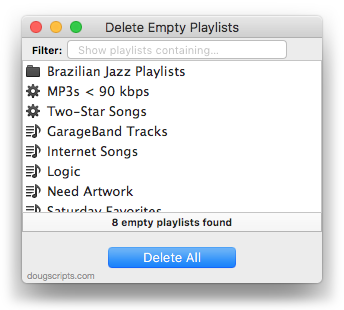 This latest version can, certainly, delete all the empty playlists it finds. But it can also delete just the ones that are selected in the list. Additionally, specific playlists can be isolated by filtering for specific text in their names. Delete Empty Playlists is free to use with a donation nag and is available to download from this page. I still like me them Smart Playlists, arguably one of the best features of iTunes. I mostly use them for organizing and sorting purposes. For example, I have a bunch that segregate tracks by various iCloud Status. But I also maintain a handful that I actually play. And sometimes it’s advantageous to refresh them by removing all their tracks and letting them repopulate with different tracks. 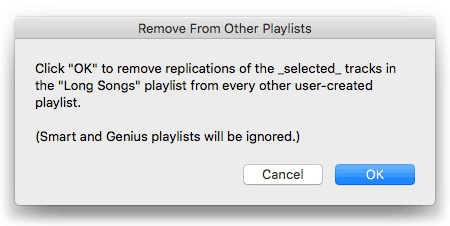 These sorts of Smart Playlists use “Live updating” and “Limit to” settings in their criteria—iTunes will prevent the removal of tracks from a Smart Playlist if it contains all the tracks from the library that meet its criteria. 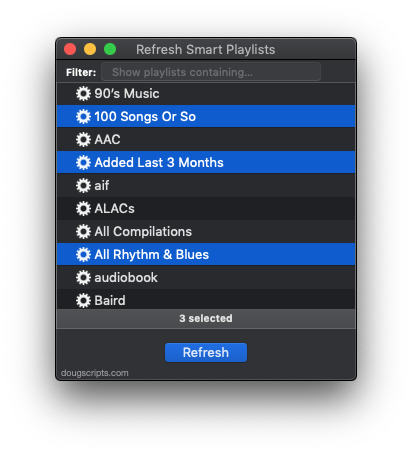 Refresh Selected Smart Playlist v1.0 will remove the tracks from a single Smart Playlist selected in iTunes. It works effortlessly when you assign it a keyboard shortcut. Both are free to download and use, but a donation for my efforts will always leave you with a satisfied feeling afterwards. 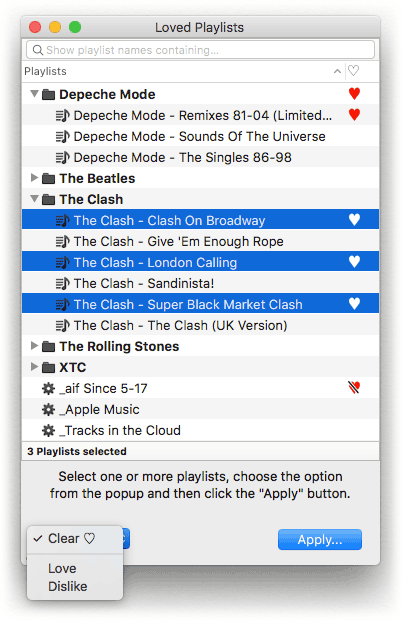 Loved Playlists will enable you to view the Love/Dislike status for “loveable” iTunes playlists and batch-edit these settings for one or more playlists at a time. Apple has not provided a means to see what playlists have been Loved/Disliked; you’d have to click the ellipsis menu (“…”) or contextual menu (right-click anywhere in the playlist header) to see if Love is checkmarked or Dislike has a minus sign. This latest version allows the Love/Dislike status of Playlist Folders to be changed. Pre-12.5.1 versions of iTunes had a bug that prevented this with AppleScript. As you probably have noticed, there is also an option to batch-edit these settings for one or more selected playlists. Loved Playlists is free to download, with a donation requested. It is for OS X 10.10 (Yosemite) and later only. I use the iTunes File > New > Playlist from Selection command a lot to create temporary playlists. Actually, I use the Shift-Command-N shortcut more often than clicking the command in the File menu. But I’m irritated at all the dancing I have to do to name the new “untitled playlist”. It takes my attention away from what I was intending to do with the tracks. So, I rigged the script below to the keyboard shortcut Shift-Command-N—and, luckily, it works. Sometimes assigning a shortcut that iTunes is already using doesn’t override the original command. The script does exactly what “Playlist from Selection” does except now I can enter the name for the playlist before it’s created. I named it “Name New Playlist from Selection”, saved it to ~/Library/iTunes/Scripts/ and gave it the shortcut using these instructions.